"Jesus saith unto him, I am the way, the truth, and the life: no man cometh unto the Father, but by me." St. John 14:6 Here is the way to God! Why go on without Him? The plan of salvation is simple, but must be taken seriously now. "Neither is there salvation in any other: for there is none other name under heaven given among men, whereby we must be saved." Acts 4:12 Contrary to what so many seem to believe, salvation is in neither the church nor a cause, but through Christ alone. Jesus said, "I am the way." "...Verily I say unto you, Except ye be converted, and become as little children, ye shall not enter into the kingdom of heaven." St. Matthew 18:3 Conversion is something more than surrounding your life with good works, religious thought and practice, or even the vain attempt to keep the law. It is a surrender of your will and way and a submission to the complete takeover by Christ. "Behold, I stand at the door, and knock: if any man hear my voice, and open the door, I will come in to him, and will sup with him, and he with me." Revelation 3:20 What if suddenly you felt the silence of the departure of His presence, never to return again? "My spirit will not always strive with man." Answer the door now, and invite Him into the living room, the place where you live, and let Him take over for life. "Neither is there salvation in any other: for there is none other name under heaven given among men, whereby we must be saved." Acts 4:12 Christ is the only door to eternal life and only unbelief can close it. "Believe on the Lord Jesus Christ and thou shalt be saved." "But if we walk in the light, as he is in the light, we have fellowship one with another, and the blood of Jesus Christ his Son cleanseth us from all sin." I John 1:7 There is no blot on your life that can't be cleansed by the blood of Jesus Christ. Believe it and go free. "Though your sins be as scarlet, they shall be as white as snow." "If we confess our sins, he is faithful and just to forgive us our sins, and to cleanse us from all unrighteousness." I John 1:9 The man who fails to admit that he is a sinner is certain never to be saved. "All have sinned, and come short of the glory of God." "I am the door: by me if any man enter in, he shall be saved, and shall go in and out, and find pasture." St. John 10:9 Pity the man who finally closes the door in his own face by his failure to take God at His Word. When He closes the door, no man can open it. When He opens it, no man can close it. "And it shall come to pass, that whosoever shall call on the name of the Lord shall be saved." Acts 2:21 God has no favorites. "He is no respector of persons." No sin is too great, no sinner so vile but what He will forgive. "For all have sinned, and come short of the glory of God." Romans 3:23 No sinner is so bad but what he can find refuge in the goodness of God through Christ the Saviour. "Jesus saves." "Repent ye therefore, and be converted, that your sins may be blotted out, when the times of refreshing shall come from the presence of the Lord." Acts 3:19 It takes more than a good thought or a kind act to assure a man of eternal life. Our salvation cost Jesus Christ His life, and it will cost us at least our pride in acknowledging that He did it for us. "I have blotted out, as a thick cloud, thy transgressions, and, as a cloud, thy sins: return unto me; for I have redeemed thee." Isaiah 44:22 Many times the Lord is far more willing to forgive our sins than we are to forget them. "Whom the Son sets free is free indeed." "For he saith, I have heard thee in a time accepted, and in the day of salvation have I succoured thee: behold, now is the accepted time; behold, now is the day of salvation." II Corinthians 6:2 Your eternal salvation is too important to put off until a day that you may never see. "Choose you this day whom ye will serve." "For that ye ought to say, If the Lord will, we shall live, and do this, or that." James 4:15 Perhaps it's alright to plan for tomorrow so long as you keep in mind who provides for it. Too many of man's plans have been left on the drawing board because God was left out. "Today is the day of salvation." Make everything else secondary to this. "For by grace are ye saved through faith; and that not of yourselves: it is the gift of God: Not of works, lest any man should boast." Ephesians 2:8,9 There is absolutely nothing that you can do to bring about your salvation apart from freely accepting what Jesus has already done. Make no mistake about it, however, there is work to be done after salvation. Work while it is day. The night cometh when no man can work. "I tell you, Nay: but, except ye repent, ye shall all likewise perish." St. Luke 13:3 Jesus was talking to well-disciplined, well-churched, well-read, but all was not well inside because they had not turned from their sins. Repentance is turning around, not slowing down, or standing still. The man who would be saved must do something with Jesus Christ, and then he must do something for Him. "I have blotted out, as a thick cloud, thy transgressions, and, as a cloud, thy sins: return unto me; for I have redeemed thee." Isaiah 44:22 In the process of His cleansing, the Saviour never leaves a stain. "Thanks be unto God for his unspeakable gift." II Corinthians 9:15 So many have failed to acknowledge the gift, much less thank Him for it. "The gift of God is eternal life through Jesus Christ our Lord." "For by grace are ye saved through faith; and that not of yourselves: it is the gift of God: Not of works, lest any man should boast." Ephesians 2:8,9 No man is good enough to save himself, and no man is so bad that God will not do it for him. "Christ died for our sins." "Though your sins be as scarlet, they shall be as white as snow." "If we confess our sins, he is faithful and just to forgive us our sins, and to cleanse us from all unrighteousness." I John 1:9 It is as we unburden ourselves to the Lord that He unveils His forgiveness to us. He said, "I will remember their iniquities no more." Believe it now, be happy forever. "For all have sinned, and come short of the glory of God." Romans 3:23 The whole world is guilty before God and is up for penalty or pardon, and every man must decide for himself which it will be. The Lord is waiting for your decision now. "Jesus saves." "So then every one of us shall give account of himself to God." Romans 14:12 Every man's record is waiting for him at the end of life's day. Old accounts are settled on earth or faced in eternity. Your Heavenly Father will forgive you in Jesus' name. "For the preaching of the cross is to them that perish foolishness; but unto us which are saved it is the power of God." I Corinthians 1:18 Take the cross out of the Christian message and we have nothing to say to the world or any solution for our sins. "Christ died for our sins." "If we say that we have not sinned, we make him a liar, and his word is not in us." I John 1:10 If we refuse to see ourselves as sinners, we place ourselves outside the reach of the Saviour. He came not to call the righteous but sinners to repentance. "And they went out, and preached that men should repent." St. Mark 6:12 This may not be the most popular message, but no one can deny that it is the most needed. Repentance is turning our backs on the old life and our hearts over to a New Leader. "For by grace are ye saved through faith; and that not of yourselves: it is the gift of God." Ephesians 2:8 No amount of work can save you, but just a little faith will write your name in the Book of Life. Scrap your plans and accept His plan for salvation. "And I saw the dead, small and great, stand before God; and the books were opened: and another book was opened, which is the book of life: and the dead were judged out of those things which were written in the books, according to their works." Revelation 20:12 Only on this side of the grave can you settle the old account. Don't leave it hanging. It will follow you into judgment. You can know now about the future. "He that believeth on the Son hath everlasting life..."
"Verily, verily, I say unto you, He that heareth my word, and believeth on him that sent me, hath everlasting life, and shall not come into condemnation; but is passed from death unto life." St. John 5:24 In an hour when the magic word is transplant, don't lose sight of the Great Physician's ability to transform. One stretches out the old life on earth. The other assures eternal life in Heaven. "If any man be in Christ, he is a new creature." "That if thou shalt confess with thy mouth the Lord Jesus, and shalt believe in thine heart that God hath raised him from the dead, thou shalt be saved. For with the heart man believeth unto righteousness; and with the mouth confession is made unto salvation." Romans 10:9,10 The person who really believes in his heart ought to have a bold testimony to go with it. "Let the redeemed of the Lord say so..."
"For whatsoever is born of God overcometh the world: and this is the victory that overcometh the world, even our faith." I John 5:4 Most of us surrender in one way or the other to the call of the world, when all the while, as Christians, we are called to be overcomers. "They overcame by the blood of the Lamb, and the word of their testimony." "But if we walk in the light, as he is in the light, we have fellowship one with another, and the blood of Jesus Christ his Son cleanseth us from all sin." I John 1:7 No sin is beyond the cleansing blood of Jesus when we simply come to Him in simple faith, believing. "Christ died for our sins." "But we are all as an unclean thing, and all our righteousnesses are as filthy rags; and we all do fade as a leaf; and our iniquities, like the wind, have taken us away." Isaiah 64:6 Don't rely on your righteousness to save you. Outside of Christ, there is no chance. Jesus said... "I am the way, the truth, and the life: no man cometh unto the Father, but by Me." "I said, Lord, be merciful unto me: heal my soul; for I have sinned against thee." Psalm 41:4 Every man's soul very often stands in need of spiritual repair. The Great Physician, Christ Jesus, stands ready to do the job. He has never lost a patient. "For Christ also hath once suffered for sins, the just for the unjust, that he might bring us to God, being put to death in the flesh, but quickened by the Spirit." I Peter 3:18 Why continue to live with sin that Jesus has already died for? Whether you understand it or not, believe it and go free. It is our responsibility to acknowledge our need and His to meet it. This He has already done. Count it as so. Father, we admit that we are sinners and that we cannot save ourselves. However, we acknowledge that Jesus is the Saviour, and we accept Him now in His name. Amen. "...Be sure your sin will find you out." Numbers 32:23 Sin, unforgiven by the Lord, is a dangerous thing to have on the loose. Under the blood of Christ, however, sin has lost its dread and power. He will forgive. "...Woman, where are those thine accusers? hath no man condemned thee? She said, No man, Lord. And Jesus said unto her, Neither do I condemn thee: go, and sin no more." St. John 8:10,11 People who dangle a past before a person ought to be conscious of the Lord's presence. "If ye forgive not men their trespasses, neither will your Father forgive your trespasses." "...whosoever believeth on him should not perish, but have eternal life." St. John 3:15 Our future in the hereafter is decided in the here and now. "Now is the day of salvation." "...now is our salvation nearer than when we believed. The night is far spent, the day is at hand..." Romans 13:11,12 Every day brings us closer to the eventual meeting with God. Will it be Reward or Wrath? Only you can decide that. "For all have sinned, and come short of the glory of God." Romans 3:23 Sin is so common, but, thank God, forgiveness is so close. Jesus said, "Him that cometh to me I will in no wise cast out." "But if we walk in the light, as he is in the light, we have fellowship one with another, and the blood of Jesus Christ his Son cleanseth us from all sin." I John 1:7 Take a good look at the word "all" There will be times when you will need to remember how deep the cleansing and how much He cares. "He careth for you." "That if thou shalt confess with thy mouth the Lord Jesus, and shalt believe in thine heart that God hath raised him from the dead, thou shalt be saved. For with the heart man believeth unto righteousness; and with the mouth confession is made unto salvation." Romans 10:9-10 Salvation is a matter of repentance, believing, and receiving. It should be followed by a lot of sharing. "For Christ also hath once suffered for sins, the just for the unjust, that he might bring us to God, being put to death in the flesh, but quickened by the Spirit." I Peter 3:18 Calvary was a one-time sacrifice for our all-time deliverance. "And their sins and iniquities will I remember no more." Hebrews 10:17 Talk to the Lord about your sin problem; ask Him for Jesus' sake to forgive you; and then forget it as He does. How can you remember something that no longer exists? Jesus said, "Go in peace, and be whole of thy plague." "Neither is there salvation in any other: for there is none other name under heaven given among men, whereby we must be saved." Acts 4:12 It's all in the name of Jesus! To introduce anyone or anything as a substitute or as a means for our salvation is to say that God made a mistake and the death of Jesus was without purpose. "In Him is life." "That if thou shalt confess with thy mouth the Lord Jesus, and shalt believe in thine heart that God hath raised him from the dead, thou shalt be saved. For with the heart man believeth unto righteousness; and with the mouth confession is made unto salvation." Romans 10:9,10 Obey the scripture; read it slowly; and be saved forever. The Christian life consists of believing, receiving and sharing. For a truly happy and productive life, take Him into your heart at once and tell it as often as you can! "Ye are my witnesses." "As far as the east is from the west, so far hath he removed our transgressions from us." Psalm 103: 12 Don't be looking for your past sins; in Christ they are far removed. Just be glad that they are. Father, thank You so much for forgiveness of the past, the privilege of the present and the promise of Your guidance and presence for the future. In Jesus' name, Amen. "All that the Father giveth me shall come to me; and him that cometh to me I will in no wise cast out." St. John 6:37 Cheer up! There is no small print in His great promise. If you have ever had any doubt that He would receive you, read this again and go to Him at once. He loves you. Attend the services in your church...feel better all week. "And they said, Believe on the Lord Jesus Christ, and thou shalt be saved, and thy house." Acts 16:31 Take this simple message of release and reality, without alteration or addition, to as many people as you can find, and let the Holy Spirit do the rest. "Come...and I will give you rest." "And when he came to himself, he said, How many hired servants of my father's have bread enough and to spare, and I perish with hunger! I will arise and go to my father, and will say unto him, Father, I have sinned against heaven, and before thee." St. Luke 15:17,18 It's a great day in a man's life when he finally wakes up to where he is and what he is missing at the Father's house. Your Heavenly Father will forgive you. In Jesus' name, He will! "He that believeth on him is not condemned: but he that believeth not is condemned already, because he hath not believed in the name of the only begotten Son of God." 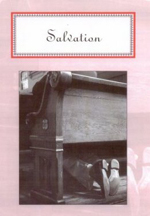 St. John 3:18 Salvation is not a wait-and-see; it is already settled for the believer...and the unbeliever. The only way to lift the condemnation is to accept Christ. "If we confess our sins, he is faithful and just to forgive us our sins, and to cleanse us from all unrighteousness." I John 1:9 We have too many "nicknames" for sins. We need to call them as God sees them, acknowledge them before Him and ask Jesus to cover them with His blood. The blood of Jesus Christ, God's Son, cleanseth us from all sin. "Then delivered he him therefore unto them to be crucified. And they took Jesus, and led him away. And he bearing his cross went forth into a place called the place of a skull, which is called in the Hebrew Golgotha: Where they crucified him, and two other with him, on either side one, and Jesus in the midst." St. John 19:16-18 Here is where the price was paid for our pardon, but everyone of us individually must acknowledge it was our sin that caused it before the pardon is valid. "Christ died for our sins." "And he said unto Jesus, Lord, remember me when thou comest into thy kingdom." St. Luke 23:42 The man who makes reservations in this life will have no regrets in the life to come. "Thou hast set our iniquities before thee, our secret sins in the light of thy countenance." Psalm 90:8 The beauty of it all is that the One who sees us as we are is willing to make us what we ought to be. In Jesus' name, He will. "Him that cometh to me I will in no wise cast out." "...Repent ye: for the kingdom of heaven is at hand." St. Matthew 3:2 Repentance is turning around and "coming to." "Come unto me, all ye that labor and are heavy laden, and I will give you rest." "For by grace are ye saved through faith; and that not of yourselves: it is the gift of god: not of works, lest any man should boast." Ephesains 2:8,9 No man works his way up to Heaven. Our eternal salvation is settled in the Saviour, not in the efforts of man. "For there is one God, and one mediator between God and men, the man Christ Jesus." I Timothy 2:5 We are saved by the grace of God through the crucifixion of Christ. Man must accept God's plan or prepare for His punishment. "That if thou shalt confess with thy mouth Lord Jesus, and shalt believe in thine heart that God hath raised him from the dead, thou shalt be saved." Romans 10:9 The evidence of real Christian experience is a combination of what we feel in our hearts and what we say with our lives. "...The Lord is witness against you, and his anointed is witness this day..." I Samuel 12:5 The testimony of a crucified Saviour will condemn or release one and all in the hour of judgment. Your future can be settled now by accepting Him. "Behold, the Lord's hand is not shortened, that it cannot save; neither his ear heavy, that it cannot hear." Isaiah 59:1 God is ever ready and ever merciful to hear the faintest cry and save the vilest sinner. "God is love." "...behold, now is the accepted time; behold, now is the day of salvation." II Corinthians 6:2 A man's life on earth and his eternal welfare in the life to come hinges on a decision that he can make in one minute. Decide now; your whole destiny depends on it. "Jesus answered and said unto him, Verily, verily, I say unto thee, Except a man be born again, he cannot see the kingdom of God." St. John 3:3 It is impossible for man to have a new life without a new birth. Being a Christian is a great deal more than joining a church and making resolutions. It is experiencing a regeneration through a crucified Redeemer. "There is therefore now no condemnation to them which are in Christ Jesus, who walk not after the flesh, but after the Spirit." Romans 8:1 The person who settles up with God here won't have to face an outstanding account in the life to come. "Believe on the Lord Jesus Christ, and thou shalt be saved." "But God commendeth his love toward us, in that, while we were yet sinners, Christ died for us. " Romans 5:8 Salvation is on a come-as-you-are basis, and people who consider themselves too good to be lost will never be saved. "All have sinned and come short of the glory of God." "...him that cometh to me I will in no wise cast out." St. John 6:37 Every honest seeker in Christ will find his eternal salvation. Nothing shall separate us from the love of God. "And he said unto her, Thy sins are forgiven." St. Luke 7:48 Man can excuse sin, but Jesus can forgive them. "If we confess our sins, he is faithful and just to forgive us our sins, and to cleanse us from all unrighteousness." "I, even I, am he that blotteth out thy transgressions for mine own sake, and will not remember thy sins." Isaiah 43:25 God does what very few people attempt to do; forget the sins of others. "For all have sinned, and come short of the glory of God." Romans 3:23 Even little sins can keep us from doing big things. Your Heavenly Father will forgive you for Christ's sake. "Then they that gladly received his word were baptized: and the same day there were added unto them about three thousand souls. And they continued steadfastly in the apostles' doctrine and fellowship, and in breaking of bread, and in prayers." Acts 2:41,42 After the revival, they were still around rejoicing and reaching out for others. This is the evidence of repentance and regeneration. "And saying, The time is fulfilled, and the kingdom of God is at hand: repent ye, and believe the gospel." St. Mark 1:15 Nothing happens in the heart until the mind is changed. "I thought on my ways, and turned my feet unto thy testimonies." "Let the wicked forsake his way, and the unrighteous man his thoughts: and let him return unto the Lord, and he will have mercy upon him; and to our God, for he will abundantly pardon." Isaiah 55: 7 Here is the road back and the reason for taking it. "Seek ye the Lord while he may be found, call ye upon him while he is near." "There is forgiveness with thee." We praise thee, oh God. "If we confess our sins, he is faithful and just to forgive us our sins, and to cleanse us from all unrighteousness." I John 1:9 We must acknowledge our need if we want it met. Pretense only prolongs the agony...and besides that, it is a frightening risk to take. "My Spirit will not always strive with man." "Come unto me, all ye that labour and are heavy laden, and I will give you rest. Take my yoke upon you, and learn of me; for I am meek and lowly in heart: and ye shall find rest unto your souls. For my yoke is easy, and my burden is light." St. Matthew 11:28-30 You can't beat this invitation, but it's not going to be there forever. Today is the day of Salvation. You will never relive today. Make it a good one with God's help. "In the last day, that great day of the feast, Jesus stood and cried, saying, If any man, thirst, let him come unto me and drink." St. John 7:37 Only Christ knows the real longing of every life, and He alone can fill it. Why wander in the wilderness ignoring His invitation? "Come unto me...I will give you rest."